We have hung it over the stairs so we see it every morning as we come down to breakfast! I deliberately captured the "Good Morning Sunshine" plaque on the lower wall though the text is a bit small to see. The hang arrangement is interesting. Without thinking about it much I bought the wooden dowel and figured I would have to cut it to size or get some hooks etc. We had not even decided where to hang it at this point. Just for giggles I threaded the dowel through the loops and placed it over the stairs. It was just the right size to wedge there. No cutting needed. Must be divine providence. So that's where it will hang. Definitely a happy ender! Thanks for the picture, Bob! Painted glass at Tyntesfield. I love the repair to the broken pane at the top right. Nothing like a strip of lead to fix things. Eerie timing... the day I stitched the pouring rain was the greyest and wettest for a very long time. And I mean wet. This is just down the hill from our house. 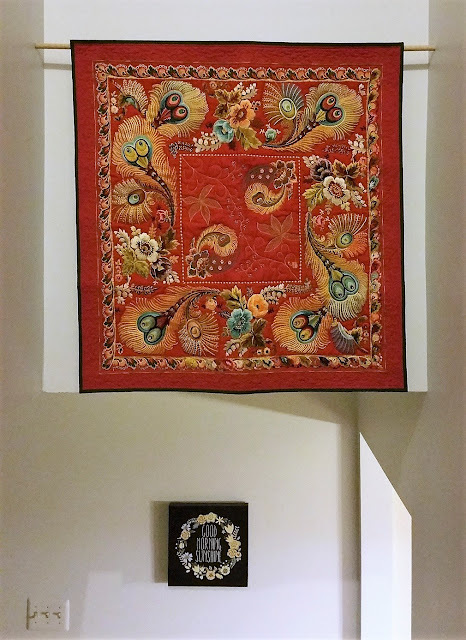 The project for the 12 x 12 exhibition is now complete except for a bit of hand stitched detail, so if the daylight improves I should have photos to show next week. ... but I can tell you that there is some rudimentary free motion quilting and four buttonholes. There shall be no buttons to match. The project in Week 115 that caught my eye was Gwyned's ice cool creation, Siren's Song. If you haven't seen her blog post yet, nip over now and see more photos. Extraordinary fan vaulting on the ceiling of St Malachy's church in Belfast. When children leave home and both end up in Ireland, sewing has to wait its turn. Last week I had six days away visiting my daughter in Belfast and then my son in County Wicklow, so there isn't much difference between this photo of my 12 x 12 project and the last one, except perhaps that this is a worse photo. The weather is rubbish, and my camera can't cope with the poor light indoors. Perhaps I shall have something rather more fascinating to show next week. While visiting my son I was delighted to be able to give this boy or girl quilt to my future daughter in law's sister for her brand new baby boy! 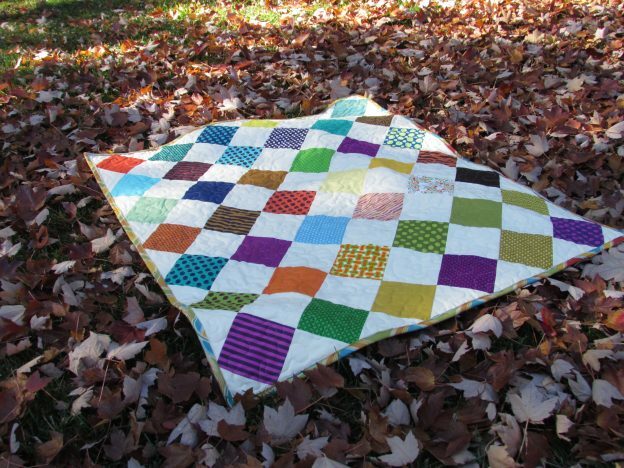 The project in Week 114 that caught my eye was Bernie's lovely colourful baby quilt. If you haven't seen her blog post yet, nip over now and see more photos. Dreamy Victorian Gothic. This chapel and the adjacent house and estate are visible from our upstairs windows, which probably explains why I have only just got round to visiting them. This video is fun, too. Not finished yet, perhaps about a third of the way there... It will be done by the end of the month, and I shall keep it secret from now on because I am making it for an exhibition in December. All shall be revealed soon enough. 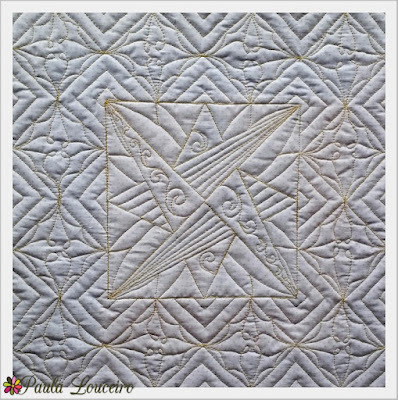 A special welcome to Paula, the first blogger to link up from Brazil. 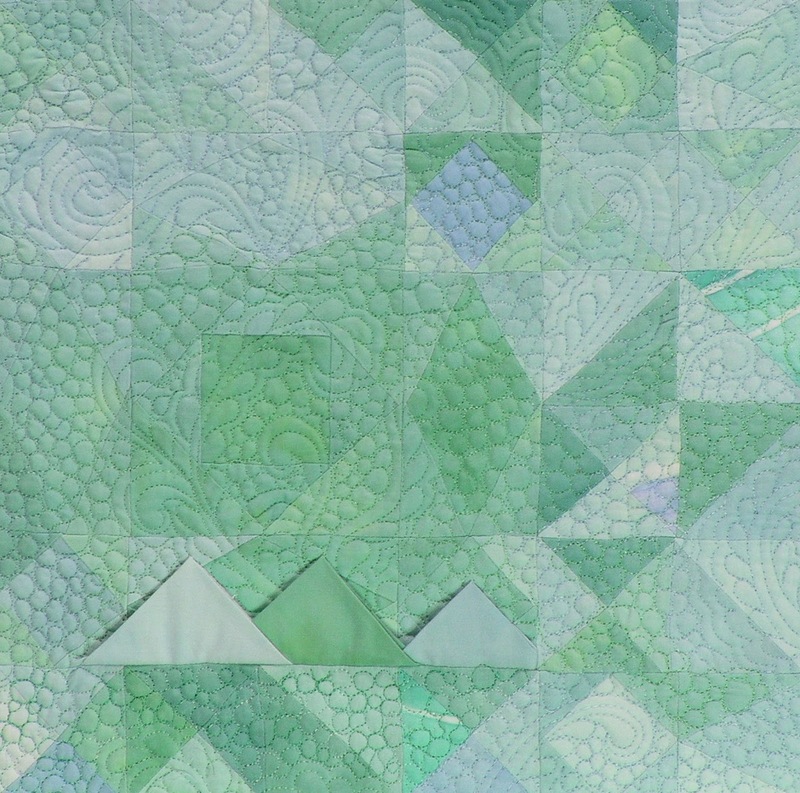 Paula has enjoyed a quick quilting course recently and is thrilled with the results, and I can see why! If you haven't seen her blog post yet, nip over now and see more photos. A glorious sunset over the Bristol Channel, taken just before 5 o'clock last Tuesday. The days are getting shorter. The idea of hibernating is rather tempting.